Home » News » Are Tradeshows Still Relevant? In the digital age, you would think just having a robust online presence would be enough. The cost of going to a tradeshow can add up. You have to have a tradeshow booth, graphics, travel expenses, promotion expenses and not to mention the time out of the office. However, socially engaging with current customers and potential customers are still important. Unexpected opportunities can sometimes present themselves on the show floor that just don’t happen when we are back at the office. Interpreting an email message can sometimes be difficult since you are not able to detect the importance of the message, body language, tone etc. Some of the complex designs brought to us by our customers are best discussed one on one. Taking the time to travel to just one client across the country doesn’t always make sense. Being able to see multiple customers in one trip economically makes sense, especially if you are traveling 1400 miles from Franklin, Massachusetts to Minneapolis! Keynote speakers and education at MD&M can put you in front of industry experts you may not have otherwise heard from. This year at MD&M Minneapolis you will have the opportunity to hear from the University of Minnesota’s Michael McAlpine, an authority on 3D printing — discusses mixing biological and functional materials via 3D and the mixtures’ impact on human bodies. On Thursday, VSI Labs founder and autonomous vehicle expert Phil Magney reveal the tech, within the vehicles and the world around them, that can make autonomous driving safe. They reveal what’s happening now and what’s coming next. 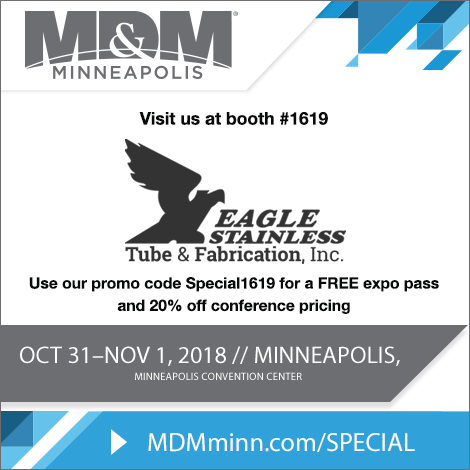 MD&M Minneapolis is taking place at the Minneapolis convention center over two days. Wednesday, October 31- Thursday, November 1. VP of Operations Rob Bubencik Jr. and Account manager John Ross will be on hand to meet with you. See you at the show!